Next to introduce is Matt Congreve. Matt’s role is Internet, Communications and Social Media intern. Having only recently joined DWA in early September of this year, he is still getting up to speed with the work of DWA. He holds a strong interest in International Development and has studied this as part of his degree at Cardiff University. 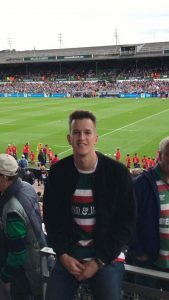 He is currently in his third and final year of his degree and outside of work and study enjoys sports and travelling, having recently lived in the United States.